Matthew Weinstein’s upcoming exhibition at the Sonnabend Gallery, with an additional project next door at Carolina Nitsch Project Room, will consist of two of his photorealistic computer animated cabarets, as well as a series of paintings and a sculpture project. In the animation ‘Siam,’ two Siamese fighting fish re-enact an oblique musical version of ‘Brokeback Mountain,’ while being entertained by a pair of dancing and singing skeletons and a singing koi. In the second animation, ‘Chariots Of The Gods,’ a mechanical fish dangles by a golden chain inside an empty restaurant. She discourses on the future, technology, devolution, aliens and the impossibility of progress. Weinstein collaborates with a wide range of actors and musicians on these animation projects; the band ‘Balkan Beat Box,’ the composer and DJ ‘Adultnapper,’ and actresses Natasha Richardson and Blair Brown. Weinstein’s paintings are based on images from the animations. Using his invented world as a substitute reality to base his imagistic paintings on, Weinstein experiments with just how far we can distance ourselves from The Real and still maintain an empathetic stance towards the world of familiar actions, ideas and events. 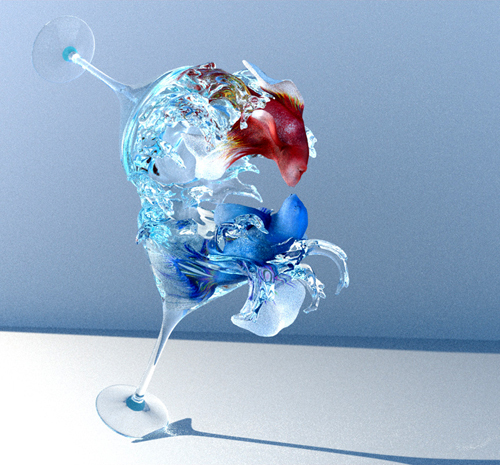 The sculpture, ‘The Kiss,’ is based on the two Siamese fighting fish who star in ‘Siam.’ It is an intimate sculpture in which a martini glass dumps Fish 1 into a martini glass containing Fish 2. 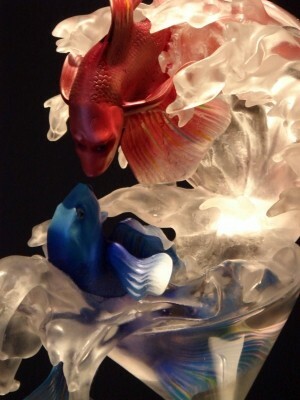 A Lucite wave contains the two fish, as they are poised in the moment before a kiss. Weinstein’s new work advances his interest in the American cultural mandate to cut ties to reality. Pleasure, pain, fear and morbidity become a placid realm of pleasure when we are entertained by the hyper-real creations of 3-D technology. Weinstein’s interest lies in what happens when an artist’s subjectivity is in charge of this technology.